Buddy Haggard, tenor, Carl Taylor, lead, Bill Woodward, bass, and Ken Buckner, baritone. The BARONS first registered with the Society in 1971 and have remained active in the Cardinal District since that time. Another combination of BARONS won the Cardinal District Championship in 1978.Establishing themselves as a top drawer comedy quartet, the BARONS have performed throughout the Midwest for these past 30+ years. After wearing down several lead singers over the years, Carl Taylor has emerged as the one who will "go the distance". Carl is a high school choral music teacher in Ashland, Kentucky. He is married to Bobbie Jo and has 2 children, Kerri and Brad. Buddy Haggard, tenor, and Bill Woodward, bass, are the originals and have sung together in the BARONS, and other quartets, for nearly 40 years. Buddy owns an appliance store in Winchester, Kentucky and is married to Phyllis. They have 2 children, Elisa and Ron. Bill is retired but still piddles around doing odd jobs mostly for his friends and neighbors. Bill and Charlotte have one son, Alan, and reside in Lexington, Kentucky.Ken Buckner, baritone, lives in Louisville, Kentucky with his wife Hollie. He replaced the baritone of 26 years in August of 2001. Ken previously sang with the Citations. Ken and Hollie have two sons, Kipp and Todd. 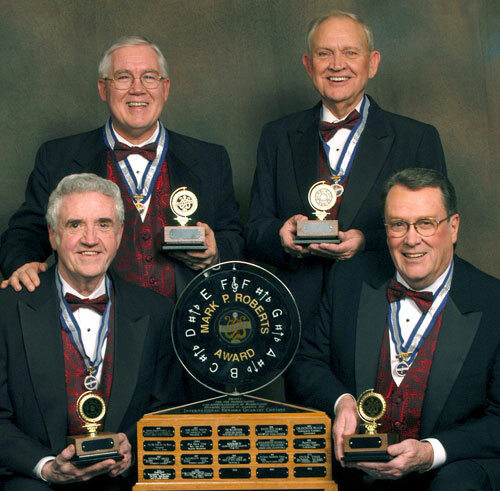 Together this combination of BARONS has over 130 years of membership in SPEBSQSA and all are active in their respective chapters Ashland, Lexington and Louisville #1. Quartet rehearsals require quite a bit of road time for all the members of the BARONS. Ken starts east from Louisville, meeting Bill and Buddy along the way and Carl heads west from Ashland. They all meet at Morehead University and rehearse in the music building on the campus. Total roundtrip for Ken is about 240 miles and just a bit less for Carl, Bill and Buddy. But when you enjoy each other's company and are having fun singing together... this is a small price to pay.The BARONS are honored to have been selected as the 2003 Senior Champions and look forward many years of singing together.